This document provides basic technical information about JustOn Billing & Invoice Management, a software for creating and managing electronic invoices. With JustOn, you can automatically capture costs, create according invoices, check, approve and distribute the invoices, file invoices for archiving and, if set up, register payments made in 3rd-party systems. In addition, JustOn combines and checks the customer and contract data that makes up the base for the invoice creation, and it can manage your accounts receivable. JustOn Billing & Invoice Management runs as an integrated application on Force.com, the cloud-based platform for software development and operation from Salesforce. JustOn's operating platform is the cloud-based Force.com infrastructure. The operation and maintenance of the globally distributed data centers is governed by Salesforce. This is why users can rely on Salesforce's proven and tested security. All Salesforce data centers and services are certified compliant with the ISO 27001, SAS 70 Type II, PCI-DSS and Systrust security standards. The cloud-based PaaS infrastructure Force.com is a high availability platform. You can always check the availability of the individual services and data centers on https://trust.salesforce.com. TÜV Rheinland has certified Force.com with respect to the German regulations about the exposure of personal data. Salesforce has approved Binding Corporate Rules with the European Union that guarantee the compliance with the legal regulations on the protection and security of personal data. Unauthorized access to personal data by Salesforce employees shall be excluded. Please find additional information about the Salesforce cloud platform in the App Cloud FAQ. 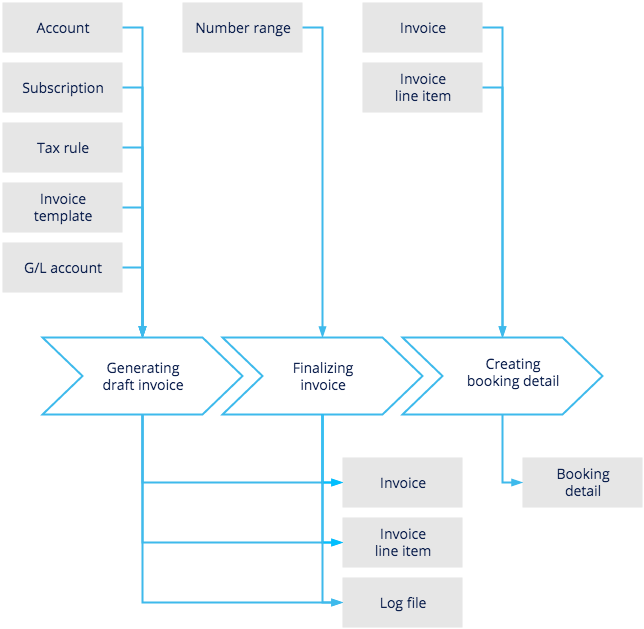 JustOn Billing & Invoice Management is a SaaS application that is deployed in the cloud-based PaaS infrastructure Force.com. Please find additional information about the app integration in Force.com in the Salesforce documentation. JustOn's operation and data storage is handled by European data centers. The current data center is shown in the URL prefix of the the JustOn application (EU0-EU11). 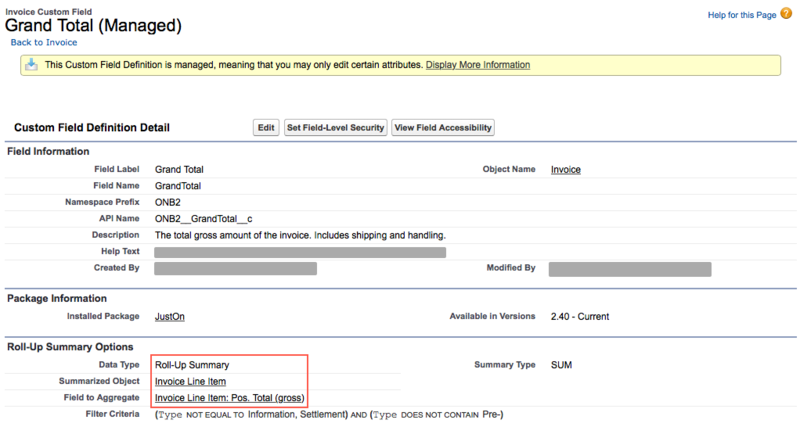 Generating draft invoice: New invoices have the status Draft. You can check draft invoices for correctness and edit them as necessary. Finalizing invoice: Finalizing an invoice sets the status to Open, making the invoice effective, that is, due for payment. Creating booking detail: Upon invoice finalization, JustOn creates booking details based on the invoice information. Users can then export the booking details to accounting systems like, for example, DATEV. By default, JustOn determines the booking period and the booking date based on the invoice run data. On a project-specific base, you can configure other dates to be used here, for example, the service period or due date. For an overview of all data included in booking details, refer to the Booking Detail object reference. JustOn calculates the taxes line by line, that is, individually for each invoice line item, and then sums the resulting item totals. Appropriately programmed features guarantee that JustOn correctly calculates the totals on a line basis and correctly balances possible rounding differences. In addition, it supports specific rounding rules, for example, for Switzerland. The formulas or data types that are used for the calculation are visible on the objects Invoice and Invoice Line Item, which are accessible via Setup > Object Manager > Invoice or, respectively, Setup > Object Manager > Invoice Line Item. The project-specific tax rules are accessible via Setup > Custom Code > Custom Settings > Tax Rules. In order to avoid saving wrong data, JustOn makes use of two standard Force.com mechanisms: record locking and validation rules. This way, JustOn ensures the data integrity of the records stored in the Force.com database. For details about record locking, see Apex Developer Guide | Locking Statements. Validation rules verify that data entered by users in records meet the standards JustOn or the operating company specify before they can save it. Validation rules contain a formula or expression that evaluates the data in one or more fields and return true or false. If required, you can configure additional validation rules for JustOn objects or standard Salesforce objects on a project-specific base. For more details, see Validation Rules in the Salesforce Help. This feature is not enabled by default. Users can, however, enable it just setting the Log Level INFO in the Global Settings. External systems (for example, accounting systems like SAP) capture information like account type, debit/credit, cancellation, etc. using specific posting keys. JustOn saves this information on the invoice using the attributes invoice class and invoice type. Different combinations of these attribute values represent specific meanings in accounting. For every generated electronic invoice, JustOn stores a record in the database of the Force.com platform. The objects Invoice and Invoice Line Item hold all fields into which the corresponding information is written. By default, JustOn creates PDF documents for invoices. The produced PDF files are distributed by email (or other additional means) and can be exported and archived. Users can configure the contents of the PDF documents using templates (see Invoices and Templates). In addition, JustOn can export invoices to other formats like CSV or XML, which can then be consumed by external systems. Depending on project-specific requirements, you set up the export type, the data to be included, etc. The information included in the exported files (PDF, CSV oder XML) constitute copies of the data as stored in the database record. For distributing documents by email, JustOn uses the email service provided by the Force.com platform (see An Introduction to Email Services). Users access JustOn Billing & Invoice Management using a web browser via a secure connection (HTTPS), where a Salesforce user account generally secures the access and makes any actions attributable to a dedicated user. The description of the clients' IT infrastructure, like the OS or browsers used to access JustOn, is not part of this technical information and is to be covered in a project-specific documentation as required. Organization security: Salesforce protects an organization's data from all other organizations by using a unique identifier that restricts access at every level to the data from anyone outside of the organization - including Salesforce employees. User security: User authentication combined with network-level security by IP address, session restrictions, and audit trails provides control and visibility into what users are doing in the system and their field history. Programmatic security: Configurable, authenticated sessions secure access to logic, data, and metadata. In addition, Salesforce offers a source code scanner that analyses the code of the apps developed on Force.com and produces a report that documents its security. Trust and visibility: Salesforce displays real time information on system performance and security (see trust.salesforce.com), and offers tips on best security practices. Please find further information about app and data security in the Salesforce Security Guide. Basically, companies secure the access to their Salesforce org - and hence, to their data - through maintaining a list of authorized users, setting password policies, and limiting logins to certain hours and locations. For more details, see Set Password Policies in the Salesforce Help. Salesforce Authenticator Mobile App: Using the Salesforce Authenticator app for mobile devices, users can verify their Salesforce account activity. Salesforce sends a push notification to the mobile device, and the user can verify and approve the activity details. U2F Security Key: Users can register a U2F security key with their Salesforce account. Salesforce then prompts the user to insert the security key into the computer’s USB port. One-Time Password Generator: If users have connected an authenticator app (like Salesforce Authenticator or Google Authenticator) to their Salesforce account, the mobile app generates a verification code, which is used as a "time-based one-time password". SMS Text Message: If users have a verified mobile number associated with their Salesforce account, they receive a verification code in a text message sent to their phone. Salesforce then prompts the users to enter the code upon login. Email: Salesforce sends a verification code in an email to the address associated with a Salesforce account. For more details, see Two-Factor Authentication and An Overview of Force.com Security in the Salesforce Help. Organization: Organizations allow accessing authorized users only, if required, limited to specific times and locations. Objects and fields: Permissions and permission sets allow accessing objects and object fields. That is, they control which data users can see and edit. Records: Using roles and sharing rules, you can limit the access to specific records. Organization users, roles and sharing rules are to be created individually on a project-specific base. Salesforce updates the Force.com platform three times per year (Spring, Summer and Winter releases). All updates are applied automatically in a timely manner. This way, Salesforce always guarantees a current, secure environment for integrated applications like JustOn. JustOn Billing & Invoice Management is continuously updated, too. There are new feature releases at least two to four weeks after Salesforce has updated the Force.com platform. If necessary, bugfix releases are published more frequently. Continuous development, update and bug fixing are essential to the legally permissible operation of an e-invoicing application and make sure that the software can be adjusted to changing legal regulations about data protection or tax relevant data, providing for a seamless and safe operation. The companies that use JustOn Billing & Invoice Management are responsible for updating the software used to access JustOn (OS, web browser, PDF viewer).